During the phenomenal migration period from June to October, Porini offer an amazing adventure through some of Kenya’s most beautiful landscapes. Journeying between Nairobi, Amboseli National Park, Ol Pejeta Selenkay Conservancy and Ol Kinyei Conservancy, you’ll have a constant front row seat to the migration, and the flights between each camp add even more ease and comfort. This spectacular seven-night flying safari starts at £3,495 per person, saving you up to £1700 per person for your once-in-a-lifetime trip. Day 1 – Today you will be met at Jomo Kenyatta International Airport and transferred to Nairobi Tented Camp for an exciting game drive, sundowner and dinner. Day 2 – After breakfast, you will transfer to Wilson Airport and board a scheduled flight to the Amboseli/Selenkay Airstrip. Arriving at the charming Porini Amboseli Camp for lunch, you’ll have the rest of the day to embark on a remarkable game drive in the Selenkay Conservancy, a 15000-acre private game reserve known for its fantastic lion, elephant and giraffe sightings. Day 3 – In the morning, after breakfast, you will enjoy a game drive in Amboseli National Park before returning to the camp for lunch. Another game drive through the Selenkay Conservancy will grace you with more unforgettable wildlife sightings, before tucking into dinner and settling into your rustic tent. Day 4 – After breakfast, you will be transferring to the Amboseli/Selenkay airstrip to board a scheduled flight to Wilson Airport, before another scheduled flight to the Nanyuki Airstrip. 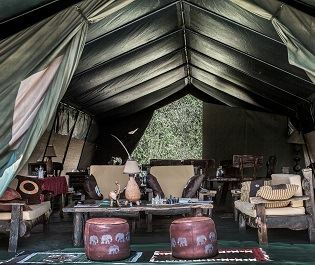 Soon you’ll arrive at Porini Rhino Camp for a chance to relax and delve into a late lunch. 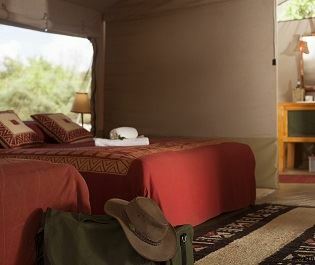 The afternoon can be spent rejuvenating at the camp, taking in the sweeping views of the Ol Pejeta Conservancy. 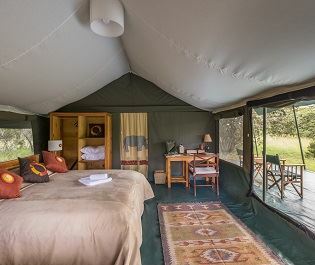 Day 5 – Today you will venture out to the Ol Pejeta Conservancy for a thrilling game drive, returning later for lunch and to spend the afternoon enjoying the camp’s facilities – possibly with a G&T in hand. will embark on an afternoon game drive in the Ol Kinyei Conservancy, returning to the camp at sunset for dinner and to chat about your experiences with new-found friends. Day 7 – You’ll wake early today, enjoy a cup of tea, and then head off on your first game drive of the day to see the Big Five wake. Return to the camp for breakfast, before an amazing nature walk across the plains with a Masai warrior guide. After lunch, you can go on another game drive and a sundowner in the Conservancy, followed by a night game drive to see the nocturnal wildlife. Day 8 – Today marks the end of this safari tour. After breakfast, you will check out and transfer to the Mara Airstrip for a scheduled flight to Wilson Airport. From here, you will be transferred to Jomo Kenyatta International Airport for your onward flight. Africa Sky specialises in fantastic tailor-made safari holidays, and our team will be happy to organise this tour alongside any other safari experiences you wish to discover. Give one of our passionate travel experts a call to create your bespoke Kenya safari adventure today. This tour can be booked as a single trip or as part of a tailor-made holiday with or without international flights.